Can Network Theory Help Explain Epic Mythology? It sounds like a crazy question. But two physicists took some time off from studying particles to study ancient epics, trying to answer classical humanities questions using network theory. In the chart above, enemies linked by red and allies by green. In a terrific story on The Verge today, Veronique Greenwood talks to the physicists and explores what they found. 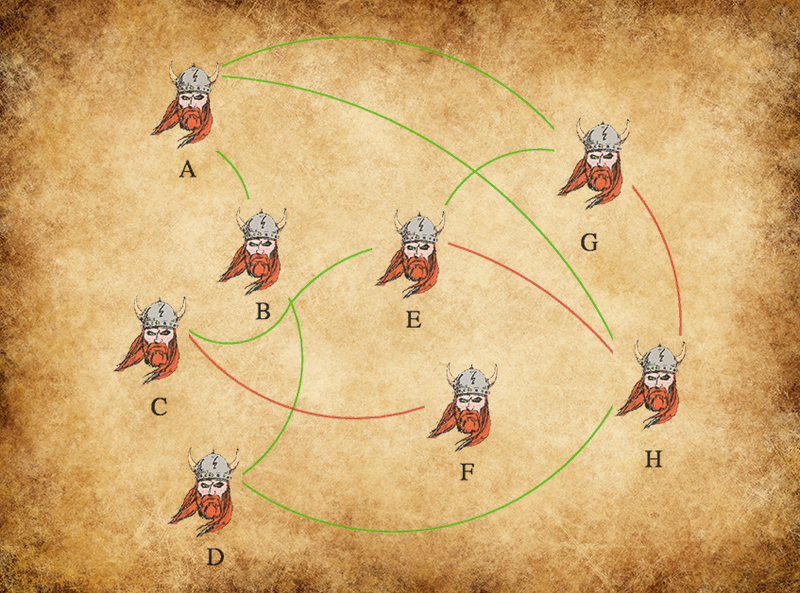 Mostly, they were interested to find out whether there were any correlations between real-life social networks and networks of allies and kin described in medieval epics like The Táin or Beowulf. Several years ago, Kenna, who has a successful career as a physicist, found his thoughts returning to mythology. It wasn't as big a departure as it might seem at first. "In statistical physics, you're dealing with objects such as gasses that are comprised of molecules and atoms," he says. "The system consists of many small entities, and so many of them you cannot deal with them individually, you have to deal with them statistically." Some physicists have started to use similar methods to look at how large numbers of people interact to produce aspects of human society, and Kenna wondered whether they could be applied to myths and stories. The Táin, which comes to us in pieces from many different manuscripts, the oldest nearly 1,000 years old, is considered literature rather than historical account. But it might still encode, in a way statistics can reveal, information about the society that produced it. Math might also help classify tales in a new way, quantitatively, in addition to the usual qualitative classifications. In thinking these thoughts, he had plenty of company — the idea that computation might be able to provide insight into literature and history has gathered speed in the last couple of decades. But it has provoked some controversy, as researchers try to figure out how computer science and statistics can be helpful in fields where trained reading and intuition are central. There are many levels of the debate, but it usually circles around to this point: Can you answer valuable questions this way? Can these tools provide information that is hard to grasp otherwise? The answer turns out out to be "sometimes," but the network graphs these would-be literary scholars created are worth everything.